Long clothing to protect from mosquitoes at night. Breathable fabric is good. Cash for your stay, ATM’s can be found at Siam Bank and Krungthai Bank in Sangkhlaburi town. Bring enough to pay for your stay in advance and buy some snacks and other small things (cheap convenience stores are 20 mins walk). A small first aid kit, plasters/bandages for blisters etc. Items such as school supplies, toys, medical gear and so forth can be purchased more cheaply in Thailand, therefore monetary donations rather than items are best. However, there are some things you can bring. The list below is regularly updated according to the needs of the home. Thumb drives and card readers. These are for office works when we need to transfer or store large files between different platforms. We can also use them to store the children’s favorite movies! Educational games or toys. This can be anything you think the children will enjoy. Second hand is fine too. We had a volunteer who brought a set of Scrabble (like a spelling game). He used it in English class, and it was a lot of fun. Old jewelry, accessories, and used clothing (baby clothes and mens shirts sell well) for the children to sell on market days. Topical Anesthetics. These will be sent to a clinic that we are building in Burma. It is hard for us to acquire any anesthetics here but we do need them in minor medical procedures like suturing. These can usually be purchased over the counter at most pharmacies. Pens, correction tapes, and pencils. We have many children in school, so school supply is always on the list of things we need. We understand that most volunteers have a long way to travel, so please don’t worry if you cannot bring any more extra luggage with you. It has already been very kind of you to volunteer with us. Many volunteers do some fundraising before going to Baan Dada. This allows them to pour money into the project that they are most passionate about, or perhaps propose a new project. In the past, ex-volunteers have conducted small charity dinners, walks, concerts, or bike rides and have raised thousands! You can either get a mini van or bus to reach Sangkhlaburi (a town 13km from Baan Dada). Air-conditioned buses leave Morchit bus station and go directly to Sangkhlaburi. It will take approximately 7 – 8 hours. There is usually 1 bus that leaves around 6am. Get there with plenty of time for the bus as tickets often sell out early! If the bus is sold out, you can get a mini-van to Kanchanaburi and then another mini-van to Sangkhlaburi. Mini vans or buses leave Sai Tai Mai for Kanchanaburi every 30 minutes. It will take approximately 2 – 3 hours. From Kanchanaburi, get a mini van to Sangkhlaburi, which will take approximately 3 – 4 hours (last van leaves at 4:30pm). You will arrive on the same street as 7/11 and CJ Express. At the end of this street (near 7/11 end) there should be a few green songthaews (covered pick-up trucks). Get on a songthaew that is heading for Huay Ma Lai (the village where Baan Dada is located). There are no English signs, just walk up to the drivers or the people hanging out near the songthaews and say “Huay Ma Lai” or “Baan Dada”. All of the drivers know about Baan Dada and will know where to drop you. Huay Ma Lai is about 13km from Sangkhlaburi and the songthaew ride is 40-60 baht (depending on how many people are in it; 300-400 baht if you are on your own). Alternatively, you could catch a ride on a motorbike or truck by the stand just outside the large parking lot and go to Baan Dada. It should cost around 150 baht per person. 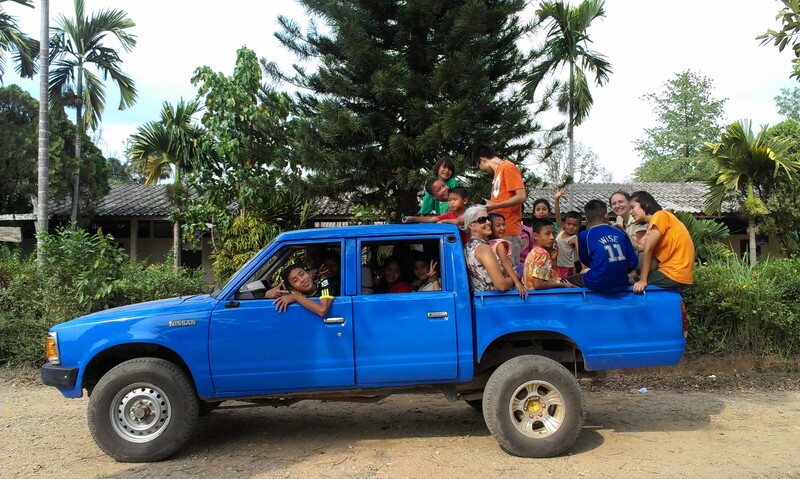 On Monday – Friday the school truck will be in Sangkhla to pick up the children from school at around 4pm, however times may change depending on the day. If you are arriving around this time and would like to catch a ride directly to the home with the children, then please email us before you depart from Bangkok so we can arrange and time and place to pick you up from! The songthaew or motorbike driver should drop you at Baan Dada. If not, you will most likely be dropped off at a crossroad bus stop with a small waiting stand on the right. You will be walking from this point. Take the right at the crossroads. Walk about 500 meters, you will go up a hill, and then down it. Early into the walk there will be a small Christian foundation on your right. At the top of the hill there should be a clay and dirt quarry on your right, next to a rubber tree plantation. You will come to another crossroads intersection as you are going down the hill. Take a right at the Baan Dada sign.